Give Your Innovations the Green Light. Innovatively shaped lights, bumpers, and interior appointments drive increased brand recognition and customer appeal in the auto industry. That’s why the development of a hybrid welding process for polymer components is so exciting. 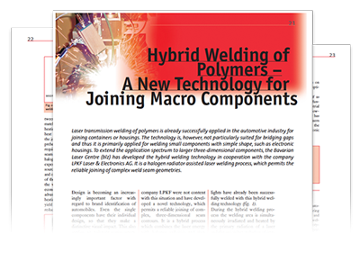 Read the brief, Hybrid Welding of Polymers – A New Technology for Joining Macro Components to learn how this new hybrid welding technology is enabling automotive engineers to create more stable 3D weld seams for market leading auto design components.